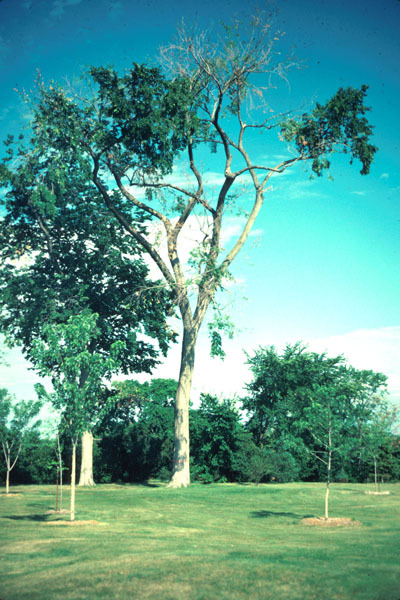 Dutch elm disease was introduced into Canada around 1940. 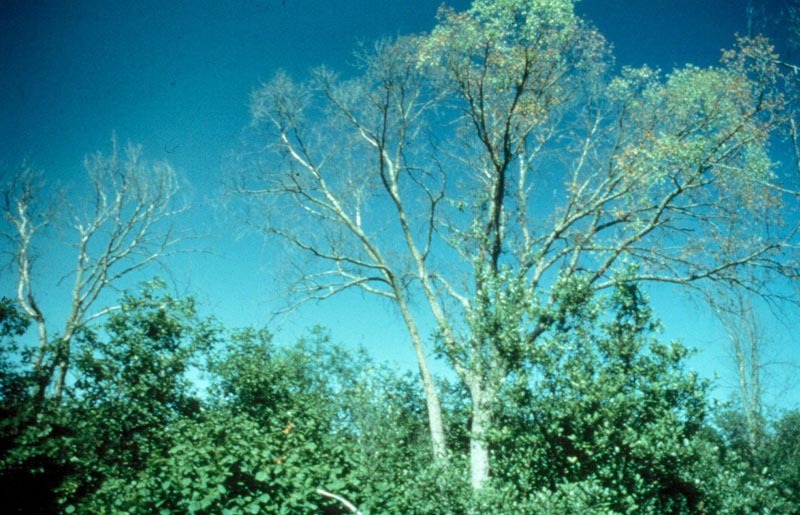 The fungus causes a vascular wilt that results in browning of the foliage and kills affected trees. Because their sap supply is cut off and fungal toxins poison them, the affected parts of the tree wilt and eventually die; this process can take a few days or a few years. 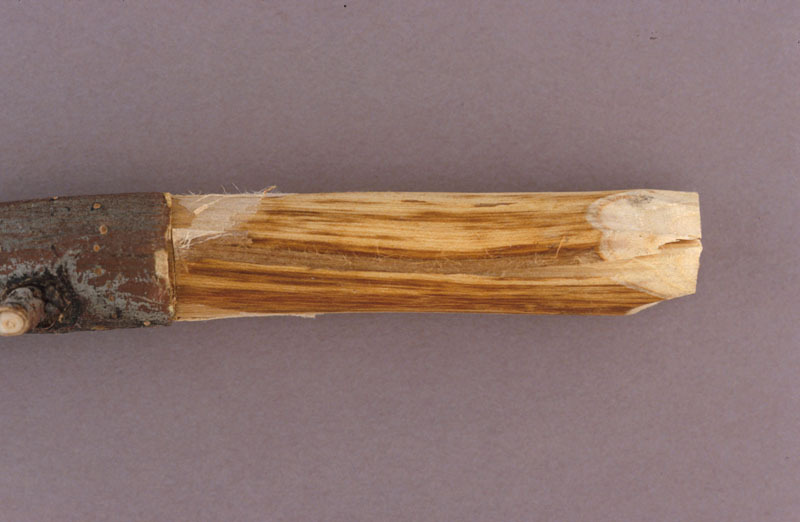 The fungus develops in the sap-conducting tissues of elm trees, under the bark. The first symptoms of the disease generally appear between mid-June and mid-July. 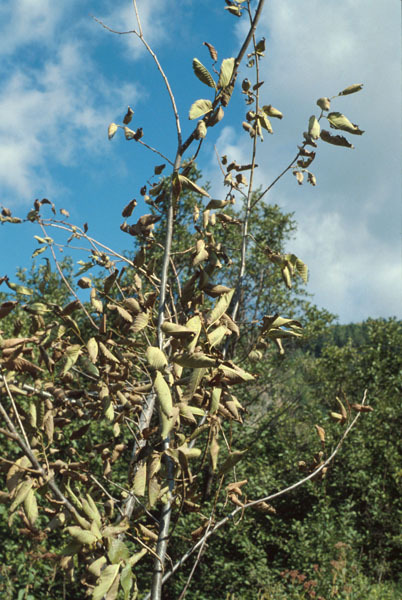 The leaves of affected branches wilt, curl up and dry out, while turning yellowish or brownish, but they usually remain on the tree. 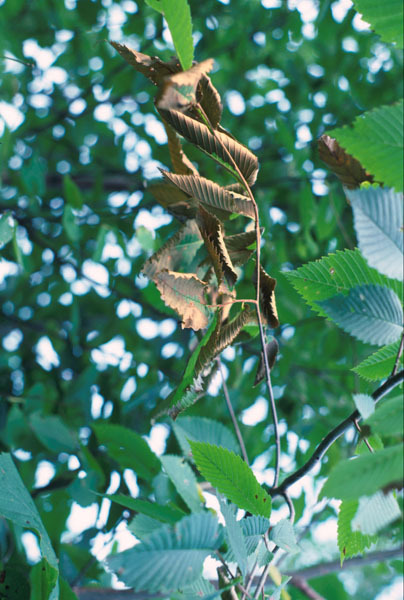 If the infection occurs later in the season, premature leaf drop usually follows the wilting. 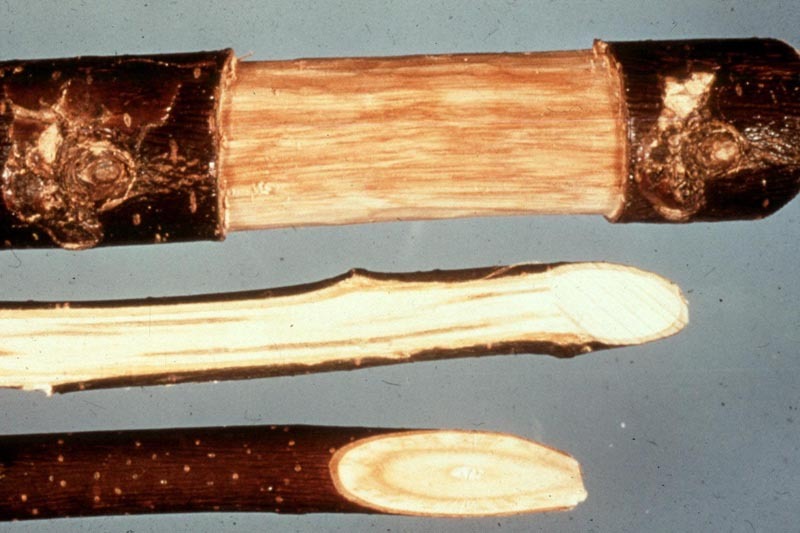 When an infected branch is cut, a ring-shaped brownish vascular discoloration can be seen. The exposed wood beneath the bark has numerous brown streaks. The disease is transmitted by bark beetles. These insects dig galleries beneath the bark of weakened trees where they can reproduce. Once spring arrives, the bark beetles, which have in the meantime become covered by spores from the causal fungus, migrate toward healthy trees and begin feeding. The beetles thus contaminate new hosts and spread the disease. A new, more aggressive disease, Ophiostoma novo-ulmi, has resulted from natural mutation of the former disease. This disease has spread from the American Midwest and replaced the disease introduced in the 1940s. In Quebec, the disease is present throughout the St. Lawrence Valley, where not so many years ago, beautiful elms graced both urban and rural landscapes. Since the 1950s, nearly all the elms have disappeared. In Montreal, for example, only a few of the 35 000 elm trees that once grew in the city have survived. Integrated pest management programs, including a survey of elms, monitoring of their health, the removal of sick elms and the injection of a chemical into the root system, have helped to conserve elms in several municipalities and institutions. For information on the products registered for controlling specific insects or diseases, please contact the Pest Management Information Service of the Pest Management Regulatory Agency (PMRA), at the following toll-free number: 1-800-267-6315.